1) How do I change the wording from “Buy Now” to “Book Now” on the listed Events page. Which template is this on and is it possible? 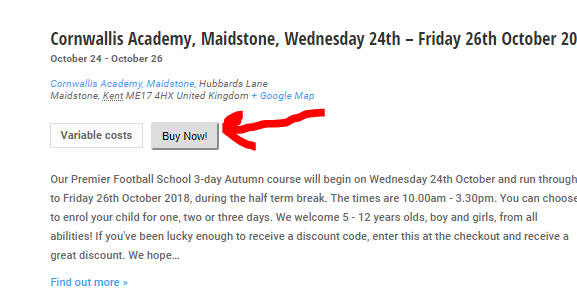 2) Instead of the Buy Now (Book Now) link going to the ticket section of the Event itself, where do I change the link so that it just goes to the page instead of the section? Hey Stephen, thanks for getting in touch! The ‘$html’ here contains the full html markup for the button, so you will need to do a ‘str_replace()’ or similar to change ‘Buy Now!’. Since you also want to change the anchor ‘#buy-tickets’ probably the filter would be the better option. Hope this helps you get started. Let me know. I also haven’t figured out within this above code how to ensure that the button doesn’t go to the #buytickets anchor that is set by Tribe and only goes to the page itself. Could you assist with both? Here is my final code for also not making it jump to the tickets. Yes Andras, I have added this to the site and it has worked! Great start to the day, thanks for your help!! Is there anything else I can help you with, before we close this? No thanks, all sorted now. I am going to close this ticket, but if you need anything else related to this topic or another please create a new ticket and we’ll be happy to help. PS: We’d be grateful if you would give us feedback on your satisfaction with support. Just click on one of the classy looking emojis below. 🙂 If you can spare a few words, that’s even better. Thanks! PS2: If you like our plugins, and you didn’t yet do so 🙂 we would also be happy to receive a review in the wordpress.org repository. Much appreciated!